Honestly, she looks like she not only came from another era, but another manga altogether. 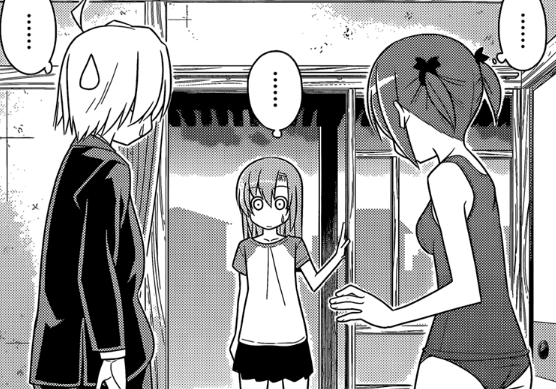 Synopsis: So, Ayumu asks Hayate if he'd kiss her too while she's in her school swimsuit. Naturally, Hinagiku had to pick this particular moment to come home and catch them in the act. Hina's shocked face is too cute here. Feeling embarrassed and out of place, she quickly turns away and tells them to continue whatever it is they were doing. Since everything's gone awkward now, Ayumu decides to change back into her regular clothes and Hayate agrees. Next up, we check in with Athena and Isumi inside the secret room in the Violet Mansion who are still trying to figure out King's Jewels related stuff and trying to reconcile some inconsistencies with what they now know about the King's Jewels and what Mikado said. Since they have no leads, Isumi pulls out an iPad Mini and makes it out to be some kind of magic box wherein a robot who can solve any problems called Siri resides. Surprisingly, Athena is so out of touch with 21st century technology that she takes Isumi's word for it hook line and sinker. 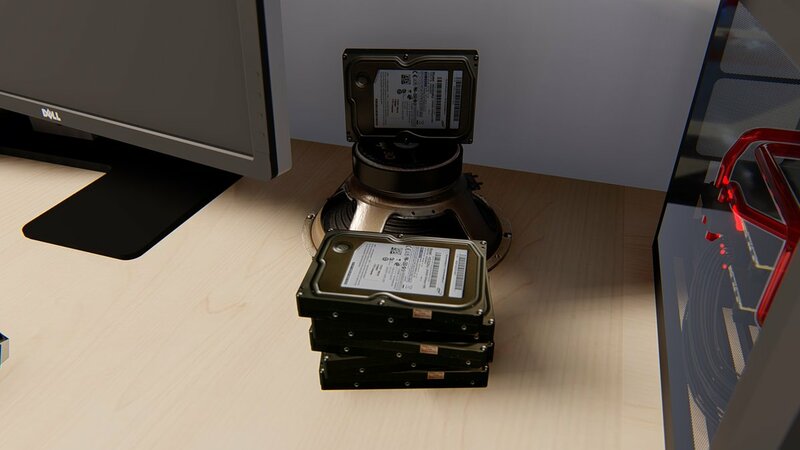 Little miss plot device doing her thing. With Athena all excited, Isumi presses the call button on the iPad and ends up calling in Sakuya's line. Isumi asks her to put on Siri but Sakuya goes all, "lol, dunno anyone called Siri," and hangs up on her. She really is genuinely surprised. Athena suggests that they have someone who actually knows how to use that thing use it for them. Enter Fumi, Sharna, Nagi, Maria and Ell-chan who are now on a crusade to help people out for some reason. I can just about imagine Hata laughing at his own work as he drew this. Fumi presents Ell-chan to Isumi and Athena and tells them that this android can support them. 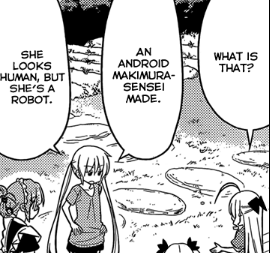 Athena asks what it is exactly and Nagi explains that it's a human-looking android made by Makimura. 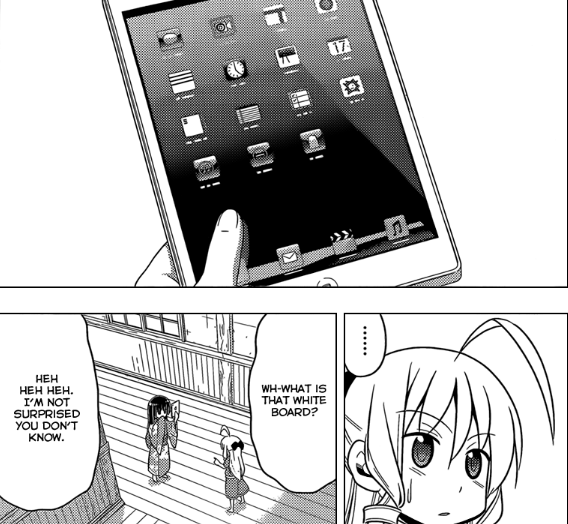 In the end, Isumi and Athena decide to have Ell-chan use the iPad Mini to calculate a simple addition problem for them. Anyway, it results in a 10, which probably means that there are now officially 10 King's Jewels, for those who are interested in that sort of thing. Having resolved that problem, Nagi says that it's time to proceed to help someone else out so off they go. I guess she's tagging along now as Ell-chan's new recognized master. Meanwhile, Hina is tinkering with her own iPad and asks Siri for info on "trouble with love," to which she gets a "I am sorry. I do not understand" response. Review: Well, this was a heavily amusing chapter. Also, did I call it or what on a third-party interrupting Ayumu's kiss attack? Anyway, Hina's face was too cute and funny just when she stumbled upon that scene. 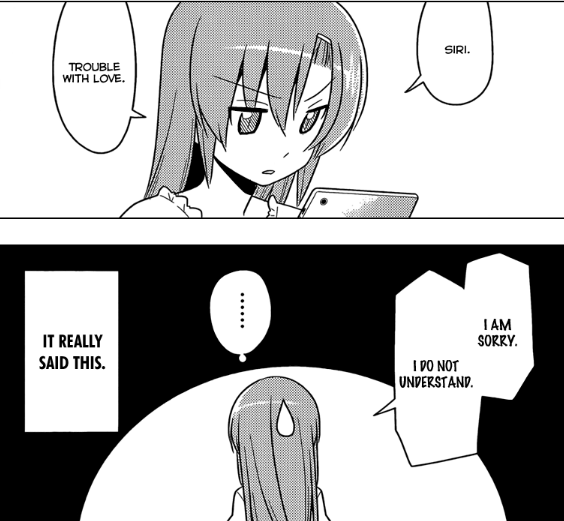 With that said, looks like Hata managed to resolve that pretty quickly without anyone getting too deeply hurt. You'd think Siri would bring up a picture of Hayate or something. 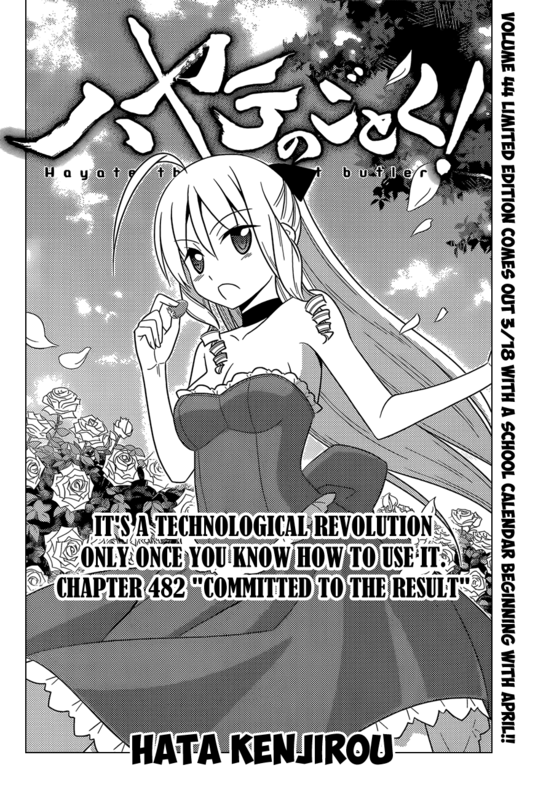 Over-all, this chapter also brings all the elements of this arc to a full circle much faster than one might expect. Nagi and Maria are now with Fumi and Sharna and Ell-chan and they're going on some wild goose chase to become "lifesavers," and they even meet up with Athena and Isumi. 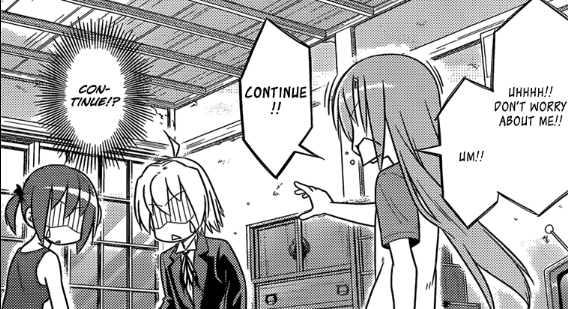 We can probably just about (see speculation corner) say goodbye to Konoha indefinitely since Ayumu's already resolved the misunderstanding involving her and Hayate's found her a part-time job, it seems. I had a lot of laughs at this chapter, although I did feel that the Siri jokes were a bit trite. 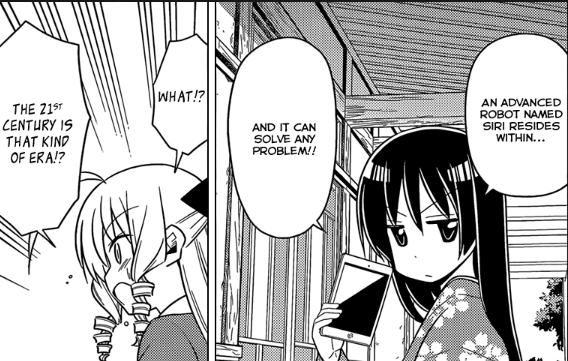 Hata does go the extra length of having Isumi and Athena have exaggerated reactions though. Speculation Corner: With this arc seemingly drawing to a close, I'd say that the one needing Ell-chan's services right now (healing a broken heart) would probably be Konoha herself since Hayate's just flat-out rejected her. I wouldn't be surprised if Nagi's party bumps into her in the next chapter. 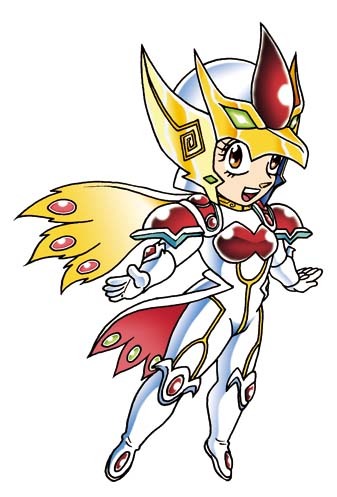 Also, I have to wonder about Athena's musings about "the 21st century," she makes it seem as if she doesn't belong in the current time period -- which would not be a surprise given how the Royal Garden seems to work and the elements of time in the series such as the Kurotsubaki and even how Hayate leapt through time in Radical Dreamers. Anyway, that's it for now. See you in the next chapter! Anyway, while Hata-sensei can be random and have Konoha suddenly appear, I tend to agree with you that we won't see her for a while.